CASE skid steer loaders deliver more power with exceptional bucket breakout force. The cab has been redesigned from the ground up to provide a larger interior that sets the standard for operator comfort and productivity. All models offer superior horsepower to give you the muscle and control you need to get any job done quickly and efficiently. 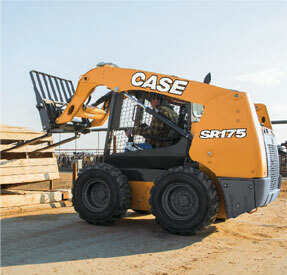 CASE skid steer loaders utilize Cooled Exhaust Gas Recirculation (CEGR) technology to offer Tier 4 compliant machines. Exhaust gases are cooled, blended with fresh air and then returned to the cylinder, lowering combustion temperatures and dramatically reducing NOx. Particulate matter is then reduced through the use of a Diesel Particulate Filter (DPF) system, resulting in improved fuel efficiency and reduced downtime.